Campers and backpackers have long juggled a conundrum - whether to prioritize space or efficiency when packing for an outdoor trip. Collapsible cookware saved space and weight but left more to be desired when actually being used. In contrast, highly efficient pots and pans saved time and fuel, but were a weighty addition to any backpack. Outdoor recreationalists were forced to choose - until now. 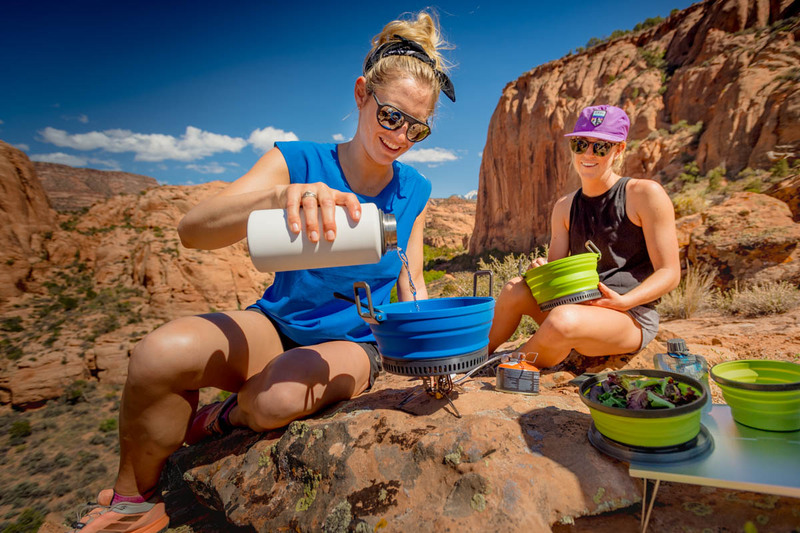 Enter the Escape line: where collapsible silicone meets high efficiency cooking power to change the way we cook outdoors. This just-launched collection is ready to serve all your camp cooking needs. First, the Escape HS pots - available in 2L and 3L sizes - are equipped with a lightweight strainer lid with built-in thumb pads, dual handles, and molded graduations. Oh, and of course, it fully collapses with ease for a minimal footprint. But that’s not all! Also available are the brand new Escape Bowl and Cup, fully collapsible pieces that nest perfectly inside the collapsed pots (and available in matching colors). This seems like a calling for a new camp cookset, don’t you think? Now let’s get to the nitty gritty. How can a silicone pot be highly efficient and fuel saving? It’s thanks to the hard anodized base built around a hyper-conductive heatsink, allowing cook times to decrease by 30% and fuel savings to increase by the same. This Teflon® with Radiance Technology coating also provides a stellar non-stick surface that resists scratches - so bring on your messiest meals. All this technology is packed into a pot that collapses down to 1.9in (or 2.1in for the 3L pot). Welcome to the Escape revolution. We love high-quality food in the backcountry - but we also love space-saving and fuel-conserving technology. With the Escape line, you get both. Now get out there and Escape!